Lid Turns into a Side Mount Tabletop. The black and chrome Odyssey Innovative Designs FZ1112WDLX Flight Zone ATA DLX Combo Rack Case is made of ABS plastic laminate over 3/8" plywood, designed to protect and transport audio mixers and controllers. It has an 11-space slanted rack area and a 12-space vertical rack section. The case has steel hardware and chrome-plated butterfly latches. It is transported by recessed, spring-loaded handles and a caster board with four wheels. The case also has steel corners, aluminum edging and rubber feet. The case meets ATA 300 specifications for shipping cases. 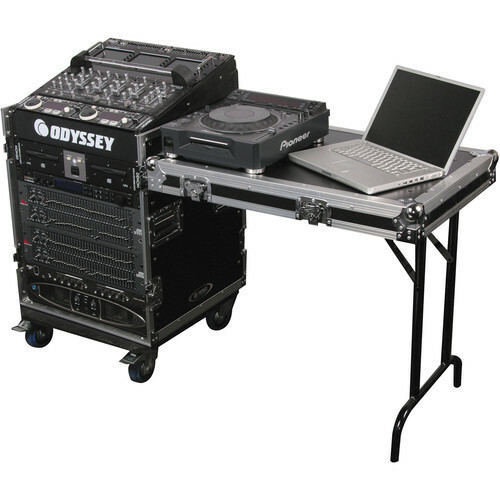 The DLX version features a lid that turns into a side mount tabletop. Box Dimensions (LxWxH) 34.0 x 33.0 x 22.5"